Kohlenberg Lyceum Series Presents Danny Glover and Felix Justice as Langston Hughes and Martin Luther King Jr.
Julia DeLancey (second from right), receives the 2005 Walker and Doris Allen Fellowship from Vice President for Academic Affairs Garry Gordon (left), Truman State University President Barbara Dixon (second from left) and Vice President for University Advancement Mark Gambaiana (right). Jeffrey Osborn (second from right) receives the 2005 Walker and Doris Allen Fellowship from Vice President for University Advancement Mark Gambaiana (left), Truman State University President Barbara Dixon (second from left) and Vice President for Academic Affairs Garry Gordon (right). Priscilla Riggle (second from left), receives the 2005 Walker and Doris Allen Fellowship from Vice President for Academic Affairs Garry Gordon (left), Truman State University President Barbara Dixon (second from right) and Vice President for University Advancement Mark Gambaiana (right). President Barbara Dixon, Vice President for Academic Affairs Garry Gordon, and Vice President for University Advancement Mark Gambaiana presented three faculty with the $10,000 Walker and Doris Allen Fellowship March 9. Julia DeLancey, associate professor of art; Jeffrey Osborn, professor of biology; and Priscilla Riggle, associate professor of English; each received a 2005 Fellowship. DeLancey came to Truman in 1995. She earned her bachelor’s degree in art history from the University of Michigan (Ann Arbor), and her master’s and doctoral degrees in art history from the University of St. Andrews in Scotland. Osborn joined the Truman community in 1991. He earned a bachelor’s degree in biology and a master’s degree in botany from Texas State University (San Marcos). His doctoral degree is from Ohio State University (Columbus). Riggle has been teaching at Truman since 1995. She earned a bachelor’s and master’s degree in English from Truman. Her doctoral degree is from Bowling Green State University (Ky.) in rhetoric and writing. The presentation of the Fellowship was done in front of each faculty member’s class, surprising the faculty member and their students. Alumni Walker and Doris Allen established the Fellowship four years ago with one of the largest outright gifts ever made to the Truman State University Foundation. The $10,000 Walker and Doris Allen Fellowship recognize outstanding faculty members who have greatly contributed to the success of the University and its students. Mary Rhodes Russell, (left) Truman alumna and former Truman Board of Governors member and president, is sworn in as Missouri’s newest supreme court justice by chief justice Ronnie White (right) March 7. Mary Rhodes Russell, Truman State University alumna and former Truman Board of Governors member and president, was given the oath of office as Missouri’s newest supreme court justice on March 7. 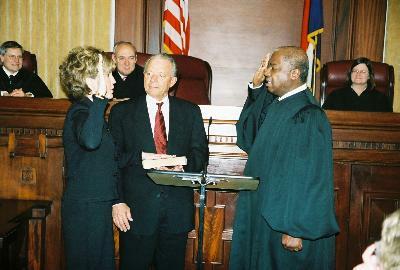 Chief justice Ronnie White administered the oath of office. Russell was appointed to the Supreme Court in September 2005. She came to that court from the state Court of Appeals-Eastern District where she had been a judge since 1995. Prior to that, she was a partner in the Hannibal law firm, Clayton and Rhodes. She received a bachelor’s degree from Truman and a law degree from the University of Missouri-Columbia. Known for her commitment and passion to community service, Russell is a well-known member of the Rotary Club and serves as a board member of the Sue Shear Institute for Women in Public Life. While in Kirkwood, Russell served as a mentor at the Matthews-Dickey Boys’ and Girls’ Club and as a volunteer Truancy Court Judge at the North Kirkwood Middle School. After moving to Jefferson City, she created a similar Truancy Court. She was presented the Woman of the Year award in 2003 by the Women Lawyers’ Association and is a member of the National Association of Women Judges. The Truman women’s swimming team gathers after winning the NCAA Division II Swimming and Diving Championships. The Truman’s women’s swimming team defeated rival Drury by 49.5 points to capture their fifth-straight national title in Orlando, Fla. Truman finished with 579.5 points, while the Panthers were in second with 530. Truman recorded a national championship March 11 as the 800 free relay team won its event. The squad, consisting of Sarah Dance, senior exercise science major from Lincoln, Neb. ; Whitney Jensen, junior exercise science major from Grinnell, Iowa; Molly Polette, freshman health science major from Wildwood, Mo. ; and Diana Betsworth, senior exercise science major from East Moline, Ill.; swam the race in 7:24.73, winning the event by nearly five seconds. On the final day of the championships, Truman picked up their second national championship, again in a relay event. The team of Betsworth, Jensen, Dance and Emily Pufall, freshman from Omaha, Neb., took home top honors in the 400 free relay with a time of 3:24.44. The Truman men’s swimming team finished in 10th place at the NCAA Division II championships in Orlando. Continuing a long streak of successes at the National Parliamentary Debate Association (NPDA) National Championship Tournament, students from Truman State University were once again at the top of their game at the 2005 Nationals at Texas Tech University (Lubbock, Texas), March 18-20. The Truman team was the runner-up to the National Champions from the University of California Berkeley in tournament sweepstakes. Seventy-one institutions competed in the tournament, in addition to international participants from Slovakia, Latvia, Lithuania and Estonia. Truman also continued its streak of elimination rounds successes, placing four teams in elimination rounds for the sixth consecutive year. Tyson Helder, senior communication and political science double major from Sioux Falls, S.D., and Samuel Hodge, freshman political science and communication double major from Blue Springs, Mo., reached the quarterfinals of the tournament, thus making them among the top eight teams in the nation (out of a field of 212 two-person teams). Sara Archer, freshmen pre-business administration and pre-accounting double major from Riverside, Mo., and Matthew “Cody” Snyder, freshman political science and economics double major from Neosho, Mo., reached the double-octafinal round (the top 32 teams). The teams of Matthew Harms, senior economics major from Galesburg, Ill., and Ryan Walsh, senior philosophy and religion and communication double major from Cassville, Mo., and Todd Turner, freshman communication major from Chesterfield, Mo., and Stefani Wittenauer, sophomore communication and political science double major from Belleville, Ill., reached the triple-octafinals (top 64 teams). The tournament uses a gradual elimination process similar to the NCAA basketball tournaments. Teams must have a winning record to reach the elimination rounds. The eventual winner of the single-elimination process was Lewis and Clark College (Portland, Ore.) which took possession of the championship cup, earned by Truman in 2004. Additionally, out of a field of 424 individual speakers, Helder ranked 13th and Hodge 16th. Truman also placed 16th in season-long sweepstakes, which is a system which measures year-long performance at invitational tournaments. Pictured left to right: Dennis Markeson, director of Sodexho; Sarah Martin, I-Club member and Date Auction coordinator; Dinisha Warusavitharana, I-Club member; Petar Mihaylov, I-Club treasurer; and Melanee Crist, assistant director for international education. Truman students made a significant contribution to tsunami relief organizations recently. Sodexho and the International Club led two separate and successful fund-raising events. Sodexho, the University’s food service provider, implemented a food fast during the week of Feb. 28-March 4. Students living in the residence halls participated in the fast by abstaining from eating in the dining halls for a designated meal. The money that would normally be spent on that meal was then pooled into a donation fund. Dennis Markeson, director of Sodexho and organizer of the food fast, said the event raised more than $2,700 to be donated to the Red Cross. Markeson said Sodexho enjoys working with students on worthwhile causes such as this. The International Club also sponsored a date auction fund-raiser Feb. 28 for tsunami relief. The group raised almost $910. This money will be donated to the Helabima Friendship Synopsis to help the surviving children of tsunami victims. International Club member Dinisha Warusavitharana recommended this organization. Warusavitharana is an international student from Sri Lanka, where more than 40,000 people died in the tsunami. Warusavitharana lost two cousins in the tsunami. The Journalism Foundation of Metropolitan St. Louis is inviting eligible students to apply for 2005-2006 scholarships to be awarded by the Foundation in the spring of 2005. Students of journalism or related fields, who are residents of the St. Louis metropolitan area, are welcome to apply. Recipients are chosen on the basis of aptitude and interest in pursuing a mass media career. Academic achievement and financial need are also important factors in the final selection process. Completed applications are due March 25. Students can stop by the Financial Aid Office, McClain Hall 103 for more information about this opportunity. Faculty, staff and students are invited to attend the following open forums and receptions. Applicant materials are on reserve at Pickler Memorial Library or can be viewed at the Business & Accountancy Division Office. Fraire’s resume can be found at the following Web site: http://www.truman.edu/avpem. Two additional candidates will be brought to campus during the week of April 4. Details on these two candidates, along with the times and locations of their open forums, will be provided at a later date. "Impact of Food Supply on Human Health"
"Impact of Synthetic Hormones on the Human Endocrine System"
Contact Cynthia Cooper at 785.4082 for more information about these events. as Langston Hughes & Martin Luther King Jr.
Tickets will be available March 24. Admission is free for students, faculty and staff with their University ID. Students may pick up tickets at the Student Activities Board Office, lower level of the SUB. Faculty and staff may pick up tickets at the Center for Student Involvement, lower level of the SUB. Call the Public Relations Office at 785.4016 for more information. The following positions on Staff Council will become available in April. You may only run for a position that is open in your assignment area/job classification. If you are interested in running for an open position, submit a statement of 100 words or less identifying who you are, your assignment area, and why you are interested in serving on Staff Council. All statements must be received at devanc@truman.edu or in person at the Human Resources Office by March 25. Visit http://staffcouncil.truman.edu/bylaws.htm to determine which area your department/ division falls under. If you have any questions, contact Human Resources at 785.4031. Where professors trade chalk for talk. Please join friends, faculty, and staff for a stimulating conversation of your choice, led by distinguished Truman staff and faculty. Each conversation is limited to eight participants and requires a reservation. You can find a complete list of conversations topics and can make your reservation online at http://rcp.truman.edu/great_conversations.htm. Contact the Residential College Program, Baldwin Hall 101, 785.4409 or rcp@truman.edu for more information or questions. Matt Safley, sophomore piano performance major from Peterson, Iowa, was recently awarded second prize in the Des Moines Symphony Young Artists Competition. Safley studies piano with Janice Saffir. Mark Spitzer, assistant professor of English, had his poem “I, Narcissus, sur le dirt” accepted for publication in Crab Creek Review. Midterm and first block final grades are now available through TruView. The May 2005 Interim schedule is now available at http://www.truman.edu/pages/431.asp. Registration for May interim courses and workshops began March 21 and will continue through the first day of the May Interim. Because students must pay for these courses in advance, they may not register for these courses online. To enroll, students should bring a Permit to Enroll form signed by their adviser, along with proof of payment from the Cashier’s Window, to the Registrar’s Office between 8 a.m. and 5 p.m. any day during this registration period. The Student Recreation Center will have a six-week program beginning after midterm break. The goal of the program is to run the equivalent of a marathon during a six-week period and incorporate strength training. The title of the program is called “Run a Marathon, Lift an Elephant.” Incentive levels vary for beginners and advanced, with prizes for all who complete the six-week program. Sign-ups will be at the Student Recreation Center and various campus locations three weeks prior to the program’s start. Roger Craik, a scholar of English Renaissance literature and professor of English at Kent State University, will be reading poetry at 6:30 p.m., March 22, in the SUB Alumni Room. Craik’s book, “The Darkening Green,” is his latest book of poems. The Speakers’ Committee in the Division of Language and Literature is sponsoring the reading. Contact Rod Taylor at 785.4067 for more information. DEPThS will host an exploration of Shamanism (medicine men in the Native American culture) and its connections to spirituality at 8 p.m., March 22, in the Baldwin Hall Little Theatre. Contact Suzy Combs at 665.3977 for more information. The subject for the Weekly Lunch Series March 23 will be “Academic Integrity: How I Handled Cheating and Plagiarism.” The talk will be from 12:30-1:30 p.m., in the SUB Spanish Room. Contact the Center for Teaching and Learning for more information at 785.4391. FAC and ICA applications for funding are due by 5 p.m., March 23, in the CSI. Applications are available in the CSI or FAC Office. Call the FAC Office at 785.7674 with any questions. SAB is sponsoring a karaoke night from 7-9 p.m., March 23, in the SUB Down Under. Admission is free, and attendance prizes will be given. All students are invited to watch and/or participate. Refreshments will be served. Contact the SAB Office at 785.4722 for more information. Join the Association of Black Collegians as they celebrate the contributions of African American women in honor of Women’s History Month. ABC will play a game similar to the television game show “Family Feud” from 7-8:30 p.m., March 23, in the SUB Alumni Room.The first four teams to sign up in the Multicultural Affairs Center will have the opportunity to play for prizes. Contact Eric Frazier at emf002@truman.edu or 785.5003. The University Observatory is open to the public, weather permitting, from 8-10 p.m., March 24. The Feminist Majority and RCP are sponsoring “Faith and Feminism” at 8:30 p.m., March 24, in the SUB Alumni Room. Becky Turner will discuss how to reconcile feminism with religious beliefs. Contact Molly Thacker at d2374@truman.edu for more information. SCEC needs 75 volunteers to be buddies for Special Olympics participants. The event is from 9 a.m.-5 p.m, April 16. Contact Cassie Morrow by March 25 for more information at cjm228@truman.edu. All volunteers and organizations are welcome. Students interested in helping with the Truman Open Track & Field Meet March 26, should contact John Cochrane at 785.4341 or by e-mail at cochrane@truman.edu. Alpha Phi Omega, the Adair County Family YMCA and Kirksville Parks and Recreation are sponsoring a free children’s Easter egg hunt at 10 a.m., March 26, on the Quadrangle. All are welcome to attend. Call 627.1485 for more information. The BIG Event is still looking for volunteers to participate during the day of service. Students will help community members with various jobs such as yard work and cleaning. Contact the SERVE Center at 785.7222 for more information. Omicron Delta Kappa is accepting nominations for the Jack Magruder/Vonnie Nichols Faculty/Staff Hall of Fame. If you know a faculty or staff member who has made a difference in your life, pick up a nomination form in the CSI or in any campus office. The forms are due in the ODK mailbox April 1. The winner will be announced at the Leadership Recognition Banquet April 27. Contact Lukin Murphy at 785.7143 for more information. The next AAUP meeting will be at 4:30 p.m., April 1, in the University Club, 516 E. Patterson. Contact Marc Becker at marc@truman.edu or call 785.6036 for more information. Sigma Lambda Gamma will celebrate the 15th anniversary of their founding, their Quinceanera, April 1. They will have professional salsa dancers available to teach salsa, tango and Latin dance from 6:30-9:30 p.m., in the Pershing Small Gym. Cost is $4. Those who attend may bring a partner to dance with or they may attend alone. A party will follow beginning at 11:30 p.m., in the Pershing Small Gym, where those who learned salsa skills earlier can use their new skills on the dance floor. Salsa, hip-hop and world music will be played at the party. Cost is $2 to attend the party. These events are sponsored by Sigma Lambda Gamma and Multicultural Affairs. Contact Lindsay Sims at 785.4167 or llsims@truman.edu for more information. Maria Di Stefano and Maureen Bell will present their research, “Promoting Student Success: Development and Assessment of an Early Identification Model,” at 4:30 p.m., April 4, in the SUB Spanish Room. Di Stefano, Bell, and Suzanne Pieper received an Assessment Grant in 2004 to research this subject. Human Resources is sponsoring a pre-retirement planning seminar for faculty and staff from 1:30-4 p.m., April 12 or April 13, in the SUB Alumni Room. There will be presentations by MOSERS and the Social Security Office. Contact Matt Moore at 785.7480 or mrmoore@truman.edu for more information. FAFSA forms are now available on the Web at http://www.fafsa.ed.gov. Students should apply soon to be considered for all available federal and state funds. Contact the Financial Aid Office, MC 103, at 785.4130 for more information. The Writing Center, located in MC 303, is now hiring students from all majors for positions as writing consultants. Consultants may choose to receive a stipend or apply their work toward scholarship hours. Stop by the Writing Center for more information or an application, or call 785.4484. Volunteer opportunities are available through the Missouri Department of Family Services, Children’s Division. Interested parties should contact Julie Sneddon at 785.2496 or julie.sneddon@dss.mo.gov.